OK, I apologize in advance for this long, long report. Just grab a cup of coffee or a Diet Coke, take a deep breath and limber-up your fingers. Here we go... 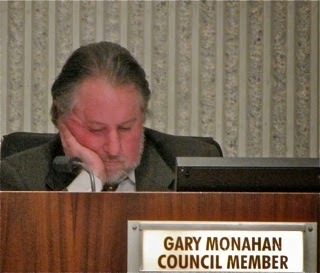 In what will be a very busy week for those of us who actually pay attention to municipal goings-on, the Costa Mesa City Council meeting on Tuesday, March 3, 2015 will be an appropriate kick-off. The meeting, which begins at 5:45 p.m. following a closed session at 5:00 in which labor negotiations involving the Costa Mesa City Employee Association (CMCEA) will be discussed. That's the group that recently approved a contract that basically took them back to the dark ages. Because this is in a closed session we have no clue what this discussion is about. 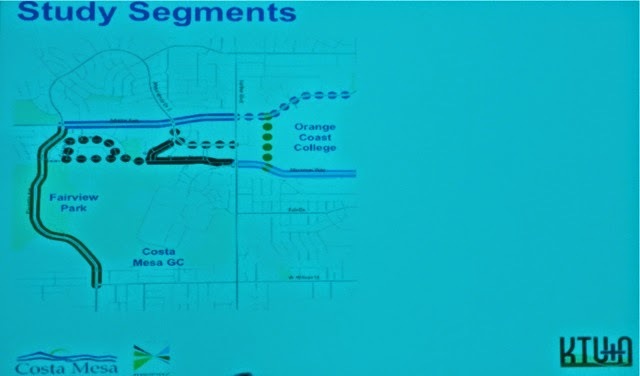 Anyhow, the regular meeting - the agenda is HERE - starts at 5:45 and has a presentation by the Transportation Corridor Agency (TCA) updating the San Joaquin Hills refinancing. Then comes Public Comments and Council Member Comments and the CEO Report. Item #5, approval of minutes from several meetings, HERE, is fascinating because the council is being asked to approve them minutes from, among others, a meeting on October 4, 2011!! Really? What giant crack did THAT one fall through? Good grief! 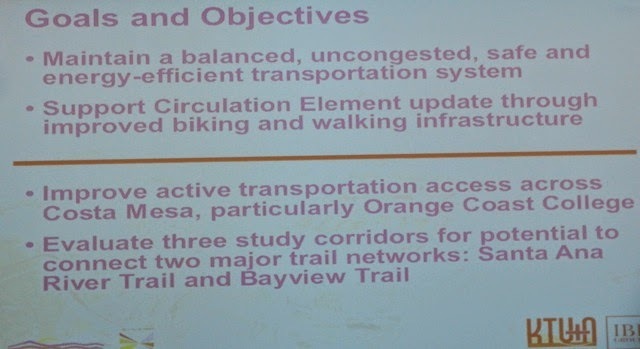 Item #8, HERE, is the resolution authorizing street closures for the 2015 Orange County Marathon on May 3, 2015. This staff report contains eight (8) attachments, including route maps and major intersections affected. Yep, we're going to pass this one without any conversation, even though it involves the deployment of roughly half of the CMPD and CMFD staff plus another 100 civilian and Explorers. Yeah, nothing going on here.. no need to talk about it. 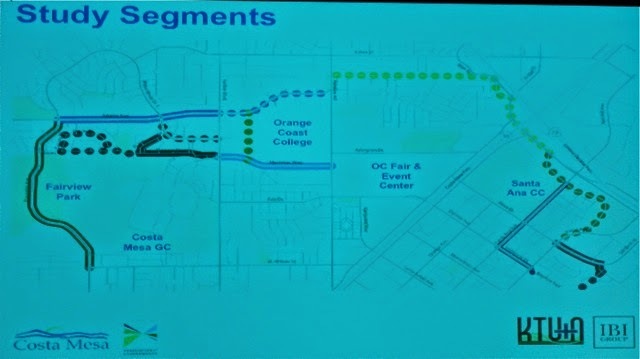 The final item on the Consent Calendar, #9, HERE, is the request for authorization to request a 24-month time extension from the Orange County Transportation Authority for the Arlington Drive Bioswale and Dry Weather Diversion Project. The City had secured a nearly $1.7 million grant last year and the deadline for the award of the construction contract is June 30, 2015. While all the technical stuff has been done, no community meetings have been held yet. 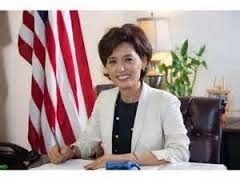 According to the staff report, meetings are planned as follows: OC Fairgrounds Board in March; Newport Mesa Unified School District representatives in April; Mesa del Mar Neighborhood in May and the Parks and Recreation Commission in June. The City is allowed a one-time delay request of up to 24 months. Yep, nothing to talk about here, right? 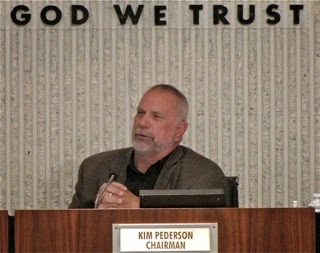 Public Hearing #1, HERE, is the COIN discussion of the Costa Mesa Police Management Association Side Letter. Because negotiations are on-going, and terms of the side letter regarding employee contributions to PERS has expired, this is a request to extend the agreement for 26 more pay periods while negotiations continue. 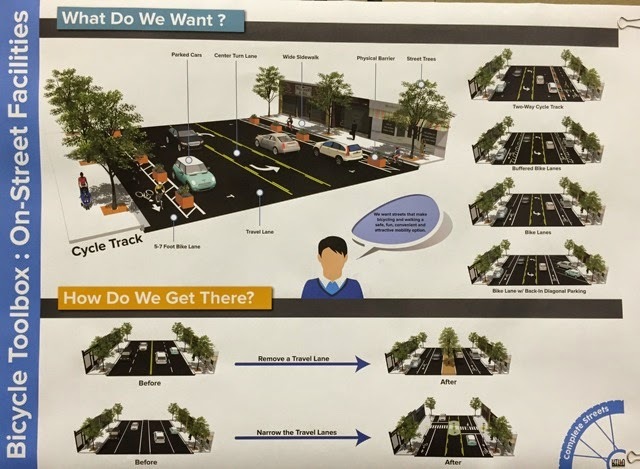 Public Hearing #2, HERE, is a change to the Small Lot Ordinance to clarify requirements for side yard setbacks and parking requirements. Read the staff report and see if YOU can figure it out! Old Business #1, HERE, is the ordinance amending the number of members of the new Senior Commission from five (5) to seven (7). Katrina Foley wanted the number expanded to nine (9) to provide broader community representation. The council majority seemed uninterested in that number. 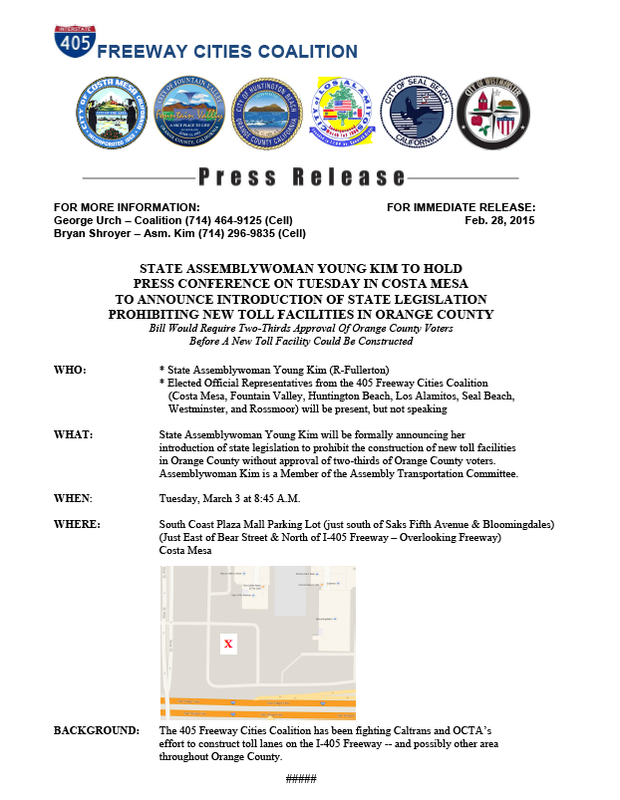 By the way, the first meeting of the Senior Commission will be held on March 10th at 9 a.m. at the Senior Center. New Business #1, HERE, is the adoption of Financial & Budget Policies. You can read the "marked-up" version of the new policy HERE. 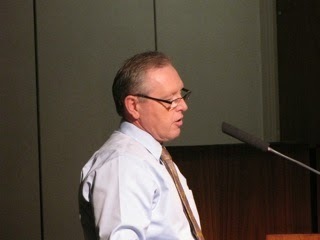 2 - Approve a plan to add up to $2,000,000 per year to reserves until the City reaches the reserves goal of $63,671,535. The staff report also includes some excellent charts showing Sales Tax, Property Tax and Transient Occupancy Tax (TOT) volatility. Click on the title of each to see those charts. New Business #3, HERE, is the Fiscal Year 2014-2105 Mid-Year Budget Report. That staff report includes links to seven (7) attachments that support and further quantify the numbers used. One of the most interesting is #6, HERE, which is titled "2014-15 Allocation of General Fund Contingency Account as of 01-27-15". This is an accounting of how CEO Tom Hatch's slush fund bestowed upon him by the council majority several years ago is being spent. As you scroll down through those numbers you'll find some interesting entries. Like, for example printing costs for the bogus Charter scheme. At the Study Session when this subject was discussed, Foley wondered if the proponents of that ill-advises scheme might hold a fund-raiser to reimburse the City for those costs. I think she asked that tongue-in-cheek, but it's a good question. I've never been comfortable with Hatch - or any City Manager - having such a large pot of cash to play with as he chooses - or as he's directed to do by the guys who hold his job in their hands. Just take a look at those entries and ask yourself, "What did law firm Best Best & Krieger do for that $25,000?" 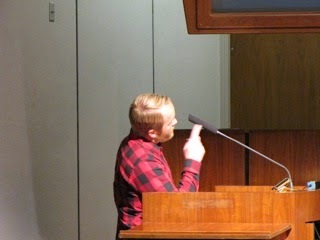 "Why wasn't that $25,000 for city-wide chair replacement included in department budgets?" And what the heck is "Council support for after election initiatives, photos, conferences, Ipad, etc." for $10,000? I'm not too concerned about Hatch misusing municipal funds, but I AM concerned about him being TOLD to spend city cash on things without any kind of open discussion or specific council approval or at least awareness. Finally, at the tail-end of the meeting, when all but the most dedicated, concerned residents will have long-since departed to their warm beds and late night television comes the final item on the agenda, New Business #4, HERE. 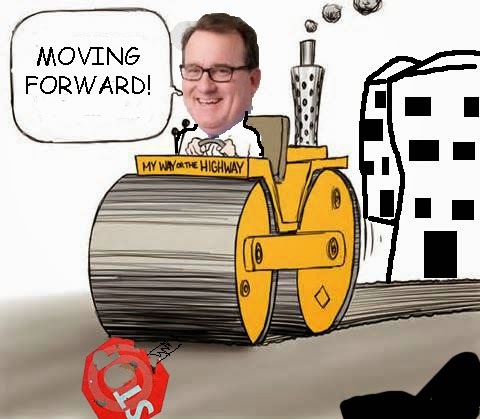 This is titled "Fairview Park Use Survey" and is Rookie Mayor Steve Mensinger's last gasp at trying to get some kind of a community consensus to plow under parts of Fairview Park to add playing fields - even though his head will explode as he denies it. It's been clear as he sat as the liaison for the Fairview Park Citizens Advisory Committee (FPCAC) for most of the meetings over the past 20 months that he was NOT happy with the clear opposition expressed by the vast majority of folks who took the time out of their own busy lives to address park uses at those meetings. Upwards of 90% of the speakers over all those months basically said, "No Way!" to playing fields ANYWHERE in the park. 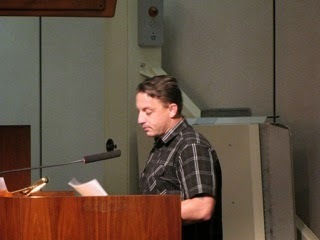 That included Chairman Dr. Richard Mehren, who finally resigned in disgust at the last meeting. Now, Mensinger proposes a tactic that will almost certainly take many more months to complete, while the FPCAC cools it's heels because their meeting next week cancelled so certain elected politicians can attend a community meeting on rehab homes scheduled at the same time. The next FPCAC meeting will be in April - if then at all - even though the staff reports are ready to go for next week. Back to Mensinger's pipe dream - "The Survey". The staff report outlines how it would work and, guess what? It involves forming yet another "Committee"! Yep, the "Consultant Selection Committee"! That's right, folks - another committee, which will almost certainly be stacked with cronies - history shows us that's their tactic. And, mark my words, it's a waste of time, because the consultant selected to do the survey is very likely to be Adam Probolsky, an OC GOP insider and go-to guy when you want a survey that gives you the answers you're looking for. No, I'm not saying old Adam would ever rig the numbers, but he has a very special way of framing the questions. You know, some of those "Have you stopped beating your wife yet?" kind of questions. 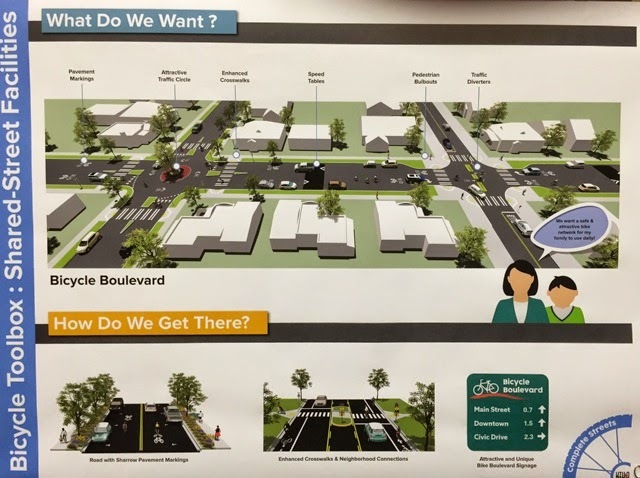 I think there is ZERO chance the council will reject Mensinger's survey scheme - he already has the votes, because Councilman Gary Monahan - who seems to have basically just checked out these days - has told us flat out from the dais that he thinks the mayor should be able to do whatever he wants to do. That doesn't mean, however, that concerned residents shouldn't step up and speak up late next Tuesday evening/Wednesday morning. HOW DO WE PAY FOR IT? YOU GUESSED IT! Oh, yes... in case you're wondering how we will pay for this bogus survey, the staff report tells us it will come from the Contingency Fund - Hatch's slush fund! Yep, he still has more than $370,000 to play with between now and the end of the fiscal year! Good Grief! 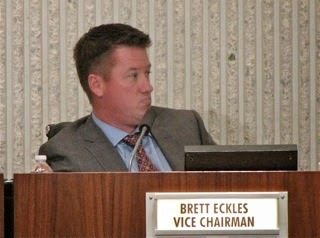 See you next Tuesday night... bring a pillow..
At the first meeting of the year for the Costa Mesa Parks and Recreation Commission last night - the January meeting was cancelled because of a "noticing" snafu - recently appointed commissioners Byron de Arakal, Bob Graham and Brett Eckles were sworn-in by City Clerk Brenda Green. Following that act, former Vice Chairman Kim Pederson was elected by his peers to be the Chairman and newcomer Eckles was chosen as Vice Chairman. 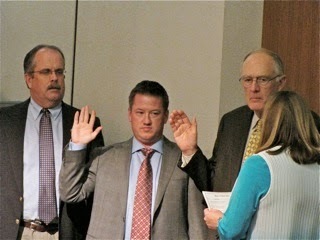 Member Don Harper was absent, so both men were selected on 4-0 votes. During Public Comments two members of the public - part of the very sparse crowd in the chambers - stepped up to address issues before the commission. 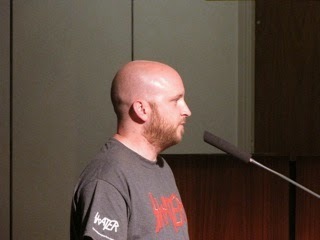 Rocky Evans asked, again, for the commission to consider extending the hours of operation at the Volcom Skate Park. He cited the coming daylight savings time and the extended daylight as summer approaches. Mark Arblaster, long time club soccer official told the commission that his organization - a Group 3 user, which means they pay to play - contributed significantly to the well-being of the fields. He said in the last year they spent $80,000 maintaining fields ($18,000 of which was at Davis Field); $41,000 in field rental and $9,000 for light rental. 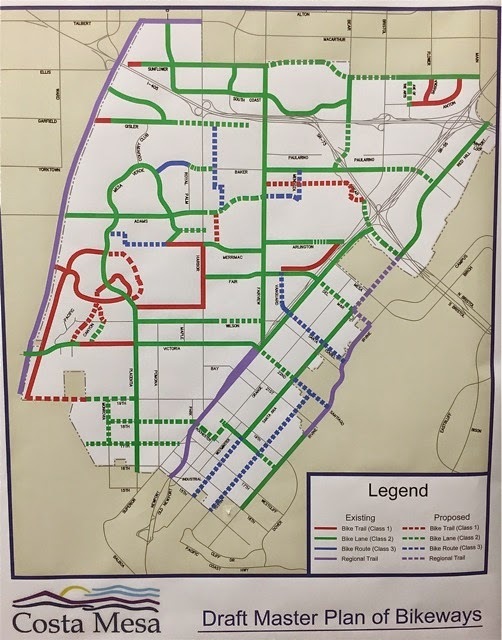 He cited new out-of-town users that have recently begun using fields and asked the commission to consider making some kind of credit available to his group to offset some of their maintenance costs. Old Business #1, the tree removal request for 3126 Cork Lane began with Maintenance Services Manager Bruce Hartley apologizing to the applicant, who was making his 5th trip to the commission on this issue, in great part due to administrative foul-ups in the noticing process. The request was for the removal of two trees. 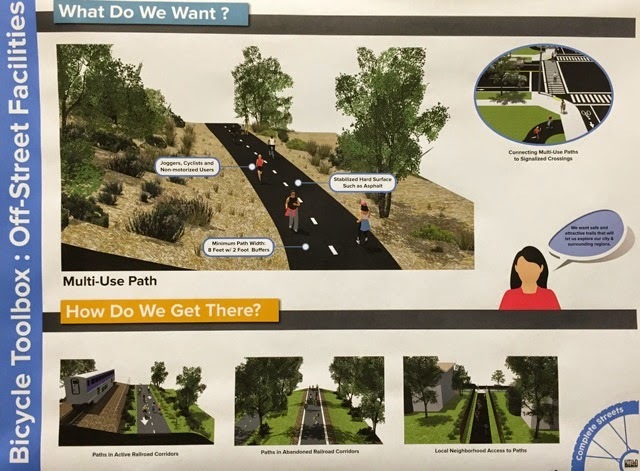 Applicant Shaun Stellman made a passionate request, including citing his tenacity and reminded the commission that recent history shows that he will "try, try and try again" to accomplish his goal - the removal of both trees. After significant discussion by the commission and staff, they decided to remove one of the trees and not the other, both on 4-0 votes. New Business #1, the tree removal request at 216 Flower Street, was also a return trip on this issue. The commission had previously denied the removal of this particular tree - a very mature eucalyptus. The tree had been pruned last year by our contract tree service. Again, after lengthy discussion the request to remove the tree was denied, but the resident - Allan Popp - was told that, when the pending driveway replacement was commenced the City would send an arborist out to check the roots because it's adjacent to the driveway and might recommend root barriers or some other action. The vote was 4-0 to deny the removal. New Business #2, the tree removal request at 3050 Madison was yet another return visit. 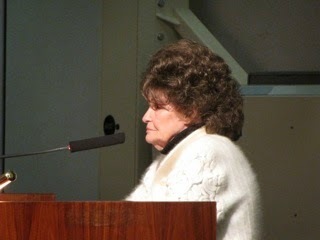 Previously the City had removed two Canary Island Pines at this location and the resident - Suzann Cummins - who told us she turned 80 two weeks ago, was concerned about her health due to the pollen and damage she claimed was being done to her plumbing. It apparently exacerbated two health issues she is experiencing. The commissioners told her that she needed to have a service video her pipes so the staff could determine if the tree in question was the culprit and that she needed to present a doctor's statement regarding the health issues for them to consider that factor. The vote was also 4-0 to deny the removal. Then came the brief discussion of Portable Turf. It turned out to be too expensive a proposition and there is currently no place in the city where it might be used - except across the street on the Fairgrounds parking lot. The commission thanked the staff for the good work and just received and filed the report. 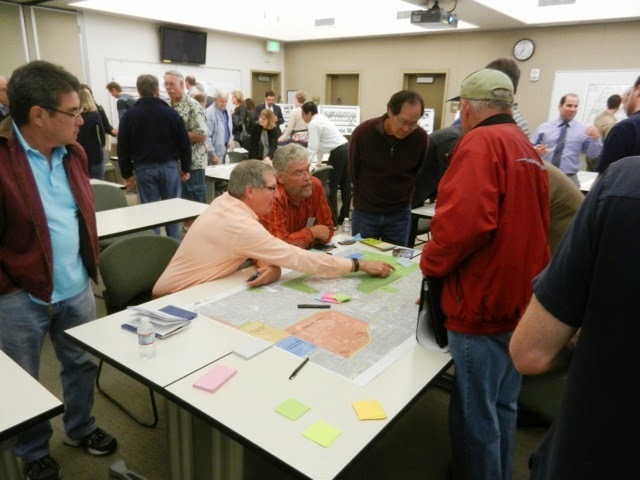 March 5th, from 6-8 p.m. at the Neighborhood Community Center, there will be a community meeting to discuss the plans for the new library at that site. The community is invited. 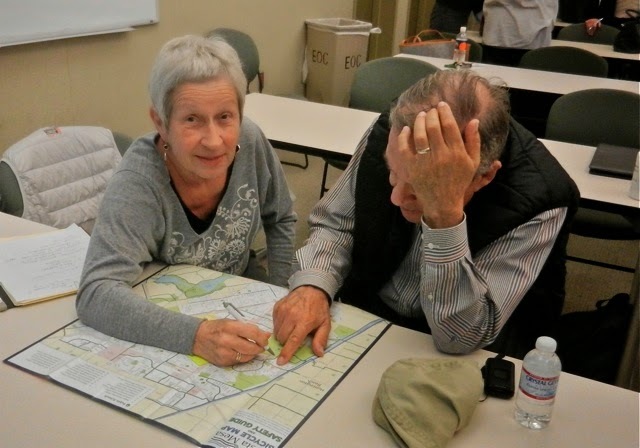 March 10th will be the first Senior Commission meeting at 9 a.m. at the Senior Center. March 12th, from 1-3 p.m., there will be an Open House at the Senior Center to show off the improvements made since the takeover by the City. 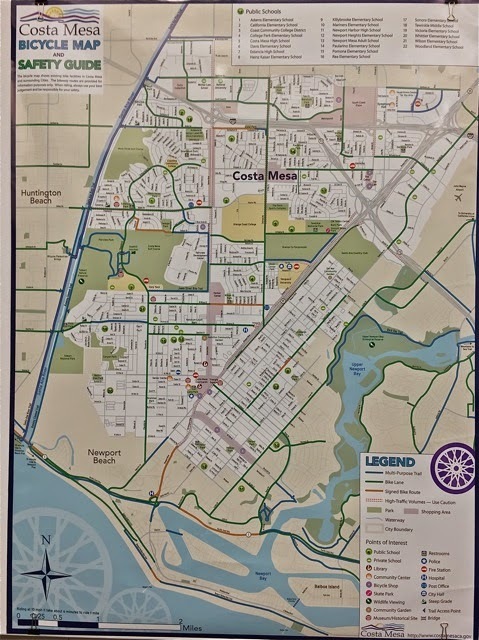 April 25th is the Costa Mesa Community Run. He also reminded us of the vacancies on many committees and the Senior Commission. I posted about that earlier. The commission adjourned to their next meeting on March 26th and the crowd - me - departed. It is with great sadness that I share with you another tragic story that involves a member of the Costa Mesa Police Department family. Tuesday evening Crystal Morales, the 19-year-old daughter of Detective Jose Morales, lost her life in a traffic accident. We offer our condolences to Jose Morales and his family and everyone in the Costa Mesa Police Department family on this sad news. 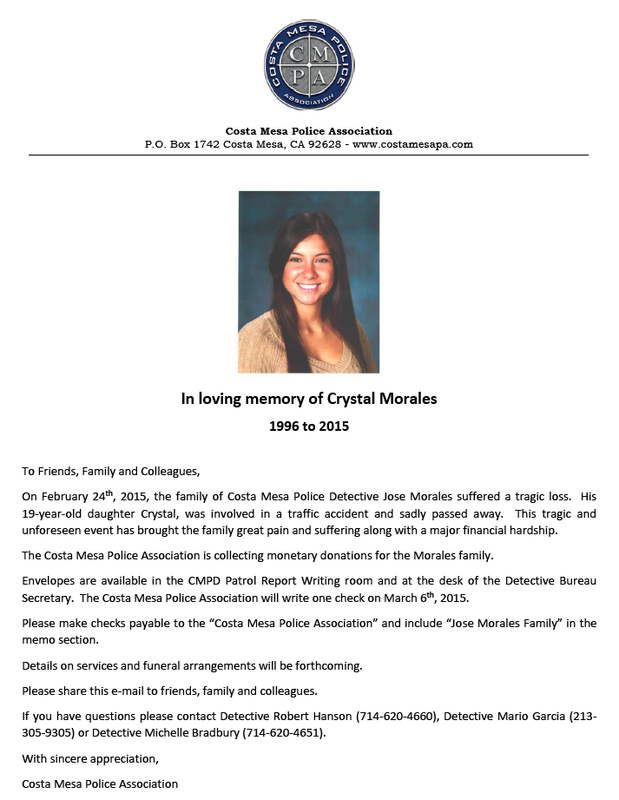 The following is the announcement of this sad event from the Costa Mesa Police Association. Click on the image to enlarge it. As some already know, the meeting of the Fairview Park Citizens Advisory Committee, scheduled for next Wednesday, March 4th, was cancelled due to a meeting scheduling conflict. The meeting is "conflicted" with was the event discussed below. It's curious that a standing meeting of an important committee, which is about to have what may be THE climactic meeting after 20 months of discussions about the future of Fairview Park, is abruptly cancelled the same day the notification and agenda is distributed. That meeting date - the first Wednesday of each month - has been cast in stone since nearly the beginning. The only thing that changed was the venue. 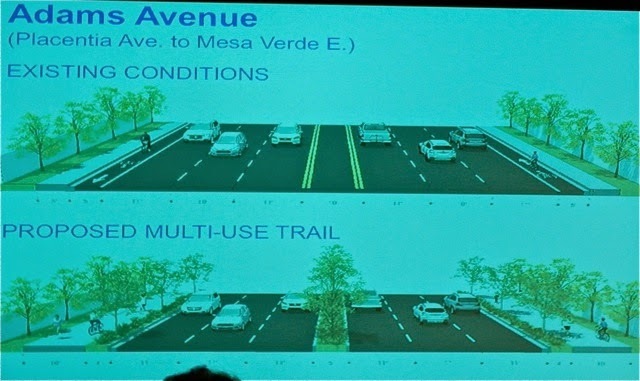 Now, all of a sudden and when it appears that Rookie Mayor Steve Mensinger may not get the consensus he's looking for to plow under sensitive habitat to install playing fields, that meeting gets bumped because it "conflicts" with this one. No, it's clear to me that this is just a bogus excuse to delay the inevitable and shove the discussion of defiling the Southeast Quadrant off until the meeting on April 1st - how perfectly appropriate! Here's the announcement sent out by members of the public who requested this meeting next week. I copied it from their flier. The format is different, but the verbiage is all theirs. Oh, yes... I do plan to attend and will report back to you if you cannot make it. YOU’RE INVITED to a COSTA MESA Q & A! The increasing number of Sober Living Homes opening up in residential neighborhoods in Costa Mesa. Find out what the new 1413 Ordinance is, and how will it be enforced. The uptick in crime in residential neighborhoods in Costa Mesa. Let’s discuss what might be causing the recent increase in the number of break-ins, tagging, drug deals and prostitution within residential neighborhoods. 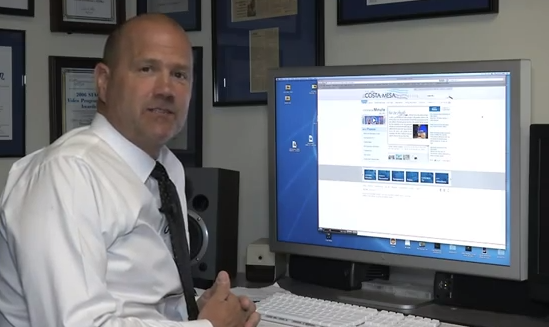 Hear about CMPD’s strategies for rooting out these problems. PLEASE ATTEND! 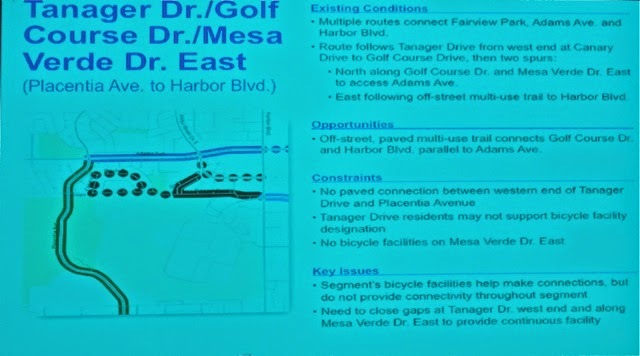 YOU will have the attention of the majority of the City of Costa Mesa officials. Come ASK QUESTIONS. INVITE your family, friends, neighbors and colleagues. We hope to see you there! Please email Deb at collegepark@att.net as for further info. 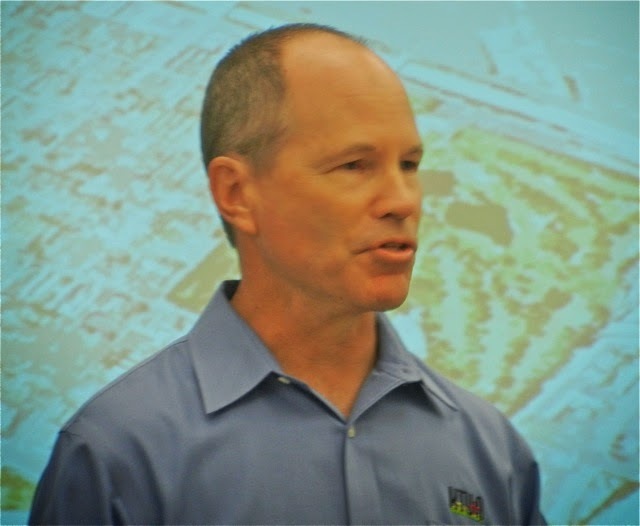 According to an article in the Daily Pilot posted a few minutes ago, HERE, Costa Mesa's Communication Director, Bill Lobdell, is leaving for a position as Vice President of Communications at The Irvine Company. This sounds like a great move for Lobdell, a man with many talents - a former editor at the Daily Pilot, the Religion reporter for the Los Angeles Times and author of his acclaimed book, "Losing My Religion - How I Lost My Faith Reporting on Religion in America - and Found Unexpected Peace". It is a terrific book and, in my opinion, not so much about religion, but about a fascinating personal journey, told well. I'm proud to say I own one of the very first copies of the book, which he inscribed thus: "Geoff, Thanks for reading my story - and for all you do as a citizen journalist. William Lobdell" I suspect he has regretted those words from time to time over the past four years, but I know he meant them at the time and I treasure them. 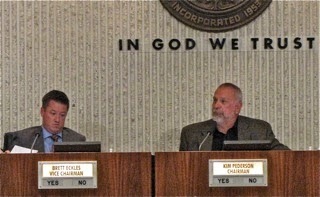 Lobdell began his assignment with the City of Costa Mesa as a public relations consultant in the wake of the St. Patrick's Day debacle of 2011, when more than 200 employees received layoff notices, young Huy Pham leaped to his death from the roof of City Hall and then-mayor Gary Monahan decided to stay at his pub in his kilt and pull beer taps rather than attend to what was likely the worst day in the history of the City. Lobdell subsequently became an employee several months later. Controversy and turmoil have marked his tenure with the City and he was the point man - the guy holding the nozzle - trying to put out the fires created by the elected leadership. The St. Patrick's Day situation was just the beginning. It was followed by so many controversies and law suits that it numbs the mind just trying to recall them all. Senior staffers across the board left in droves - retired or resigned or left for other reasons - many seeking relief from the toxic workplace created by the elected leadership. The relationship was particularly strained between the elected leaders and the Police Department, which saw staffing numbers dwindle to precarious levels and highly-respected police chiefs leave in protest. And the top two elected leaders sued the men and women of the Costa Mesa Police Department. There were times when it seemed like Lobdell was a man juggling an armload of unhappy porcupines while running across a bed of hot coals. This was his first PR gig and one could certainly observe that it was a real baptism by fire for him. Because of his role as the tip of the PR spear on behalf of the city, Lobdell has been the subject of harsh criticism by folks who were angry about the direction it was being taken by the elected leadership. Of course, it's normal to attack the messenger. Personally, I think he did as good a job as he could under the circumstances. Also during his tenure the communication process improved and the City has received awards for Transparency, in great part due to his efforts. And, the long-overdue upgrading of the audio-visual infrastructure in City Council chambers and in the control room may finally take place - after he leaves - due to his support. While he and I frequently disagreed on issues and tactics, and he disagreed with the way I reported events during his time with the City, I admire Bill Lobdell for his skills and his tenacity and wish him well in this new, very exciting assignment. 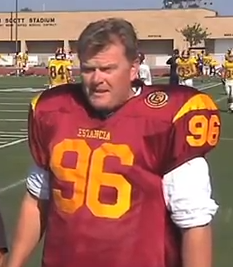 There may be no more prestigious communications job in Orange County than the one he begins next month. Good luck to him in this new assignment. 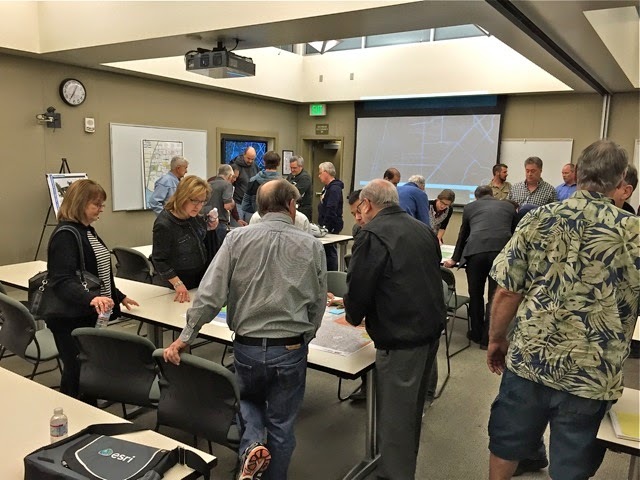 Wednesday night nearly four dozen interested parties snuggled into the Emergency Operations Center (EOC) adjacent to Police Headquarters for a presentation by City staff and consultants on the program currently underway to study how to make Costa Mesa more bicycle-friendly. 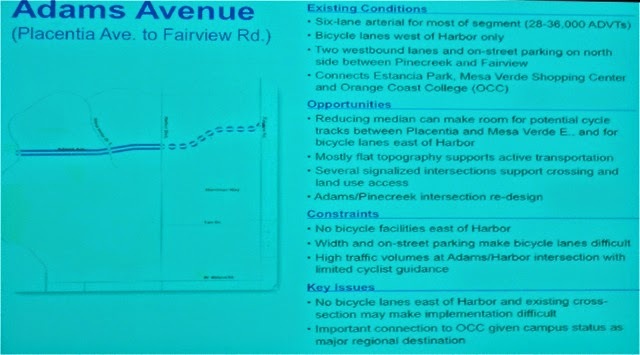 Specifically, how to navigate by bicycle across town. 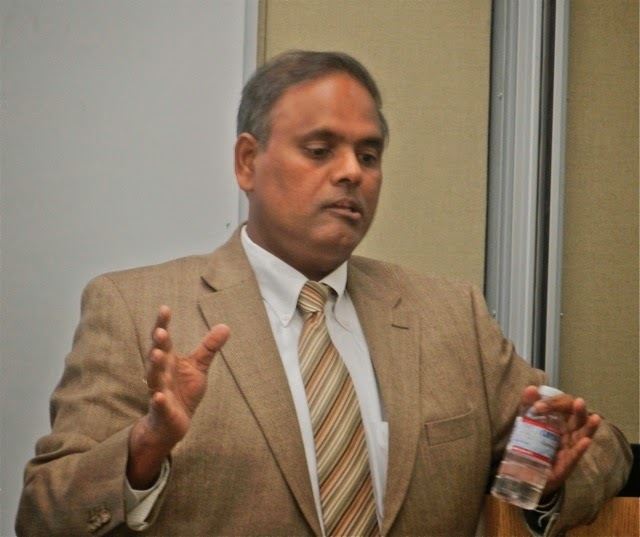 Transportation Services Manager Raja Sethuraman kicked things off, then tossed the baton to John Holloway, a consultant from the firm BTU+A, who guided the discussion/presentation from that point forward. 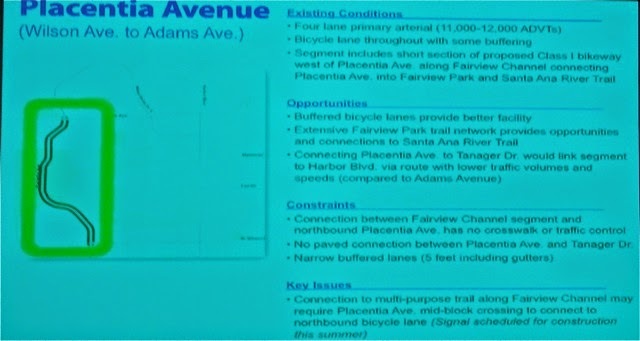 Holloway used a PowerPoint presentation that will soon be available for viewing on the City's website. And, throughout the room were several posters with informational displays, some of which are shown here. If you click on the images they may be easier to read. 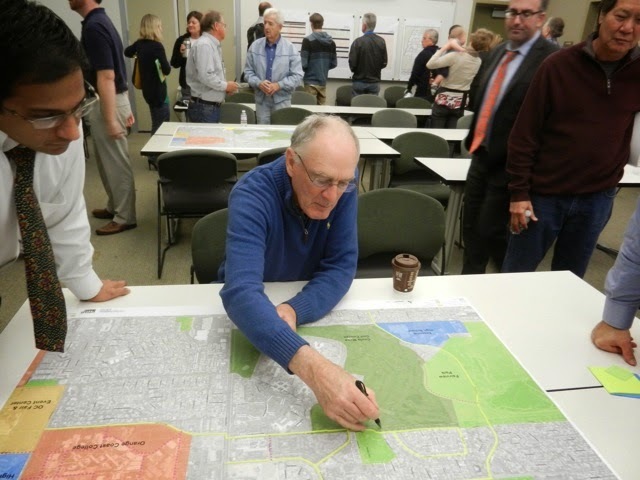 Among the attendees were former councilman and recent candidate Jay Humphrey, former candidate Tony Capitelli, and current planning commissioner Stephan Andranian, an avid bicyclist himself. There were many other familiar faces - folks who regularly attend and participate in the discussion in important meetings. 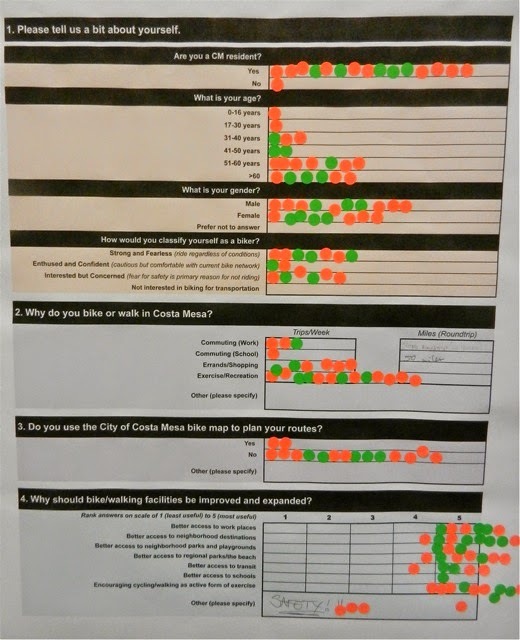 Following the presentation the attendees were asked to participate in providing information by making notes on one of several large city maps available, and by making notes and affixing colored stickers to charts on the walls. That information, and similar data gathered from the second of these meetings will be included in the final report prepared by the consultants. I think the information on the images from the charts is pretty self-explanatory. 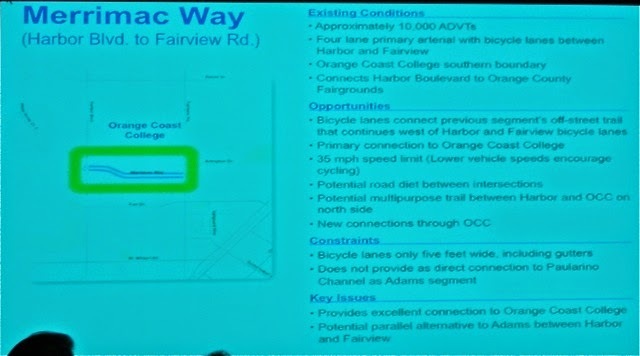 It was clear from the discussion that OCC is a pivotal element in this plan. 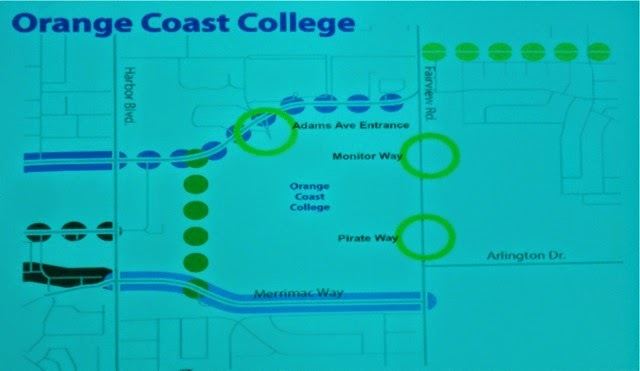 Dean Abernathy, an instructor at OCC and most recently a member of the Parks and Recreation Commission, told us that OCC staff is now working with City staff to coordinate their efforts, particularly as to how the OCC expansion plans currently underway might impact the results of this process. 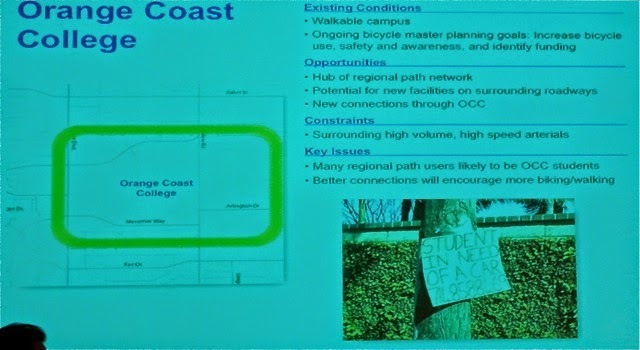 He also told us that Costa Mesa has the highest bike use in the county, and that OCC's projected growth from 17,000 to 20,000 students in the near future - many of whom will likely be foreign students without automobiles, will jack up that use ratio significantly. 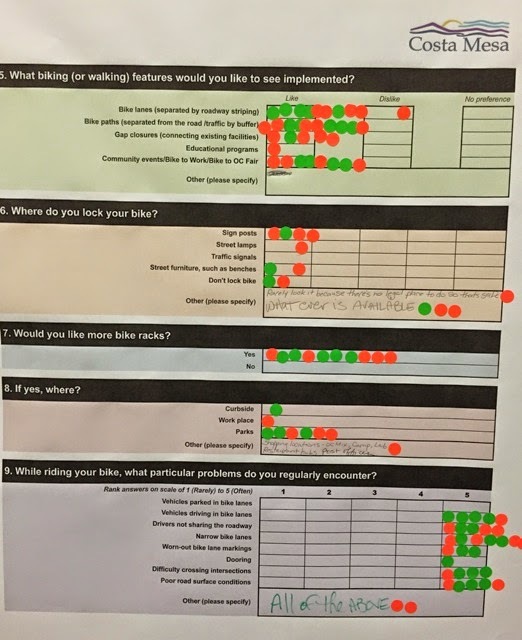 From the discussions I overheard following the presentation and during the "notation" part of the meeting, it seems that most bicycle enthusiasts who attended felt this was a good step. 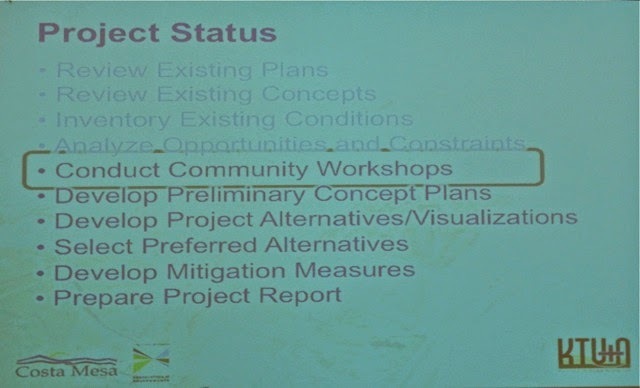 I'm looking forward to seeing the next step in the process, defined in one of the slides here - the next meeting.